The F series is the .22 Long Rifle caliber general purpose target pistol variant of the classic Star pocket pistols. 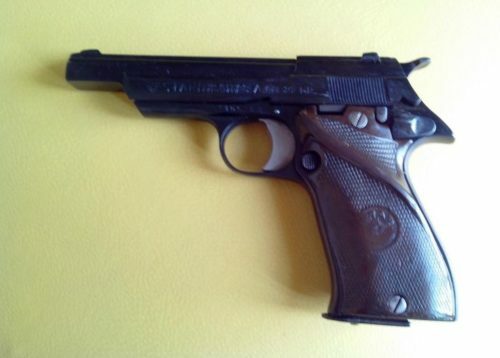 Its first appearance was in 1932, concurrent with the similar-sized I-series .32 pocket pistols; both of these are the largest of the lineage. The E-series continued the line with an ultra-compact .25 ACP (6.35 mm) in 1925, and the larger .25 ACP C-series series first appeared in 1930. All these pistols are generally similar in arrangement and scale, with a fixed barrel, straight blowback operation, and single action lockwork. All have a thumb-operated safety just behind the trigger on the left side of the frame, and the takedown button is to the rear of this, in a notch in the top of the grip panels (note that some series moved to a conventional thumb safety later in life).